Each year the U.S. News & World Report unveils its annual ranking of best online programs in an effort to help the millions of students researching online program options compare the academic quality of more than 1,200 U.S.-based distance learning programs. For the fourth consecutive year, the University of St. Francis (USF) is proud to announce that five eligible online programs appear on this highly distinguished list, including online bachelor’s, online MBA and graduate online programs for business (not including MBA), education and nursing. All programs ranked in 2017, particularly nursing and education, increased several places from the 2016 list. A full listing of the 2017 Best Online Programs can be found at: usnews.com/education/online-education. 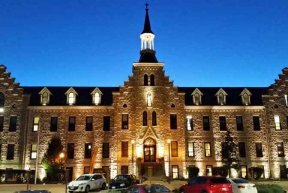 The University of St. Francis, in Joliet, Ill., serves 3,850 students nationwide, offering undergraduate, graduate and doctoral programs in the arts and sciences, business, education, nursing and social work. There are 47,000 USF alumni across the globe. For information, call 800-735-7500 or visit stfrancis.edu. University of St. Francis: Bigger thinking. Brighter purpose.